If you are serious about slowing down this year and want make certain your succeed, one of the easiest, and most powerful ways is a series of one-to-one coaching sessions. I will work with you to develop an individual plan for you to start slowing down. A full assessment will be taken of your current situation and then we will work together to help you develop a plan for slowing down. Throughout the process I will give you all the support and help you need to succeed in your wish to slow down. To give you idea of the sort of thing that coaching can do, have a look at the process I did for Cosmopolitan Magazine in November 2009. To read the article, go to www.cosmpolitan.co.uk or CLICK HERE. As a New Year offer, you can book 3 sessions for the price of 2! Sessions can be carried out over the phone or via skype (which is totall free to install and use and much cheaper than a phone call! ), or face to face if you are located in Birmingham or Cardiff, UK. I have worked with people all over the world and sessions can be booked at a time to suite you. For more information, please go to my coaching page here, or click here to contact me to book a session. 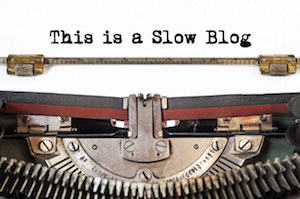 PS, I jumped the gun a bit last week announcing the “Welcome to the Slow Life” eCourse, I have had a few technical hiccups that has slowed(!) the process down, hopefully the first enrolment will start in the next few weeks. To register your interest and get a special “pre-registration” discounted price of $39.99 please click here to contact me putting “Welcome the Slow Life Pre-registration” in the comments box and I will add you to the list and send you some free goodies!